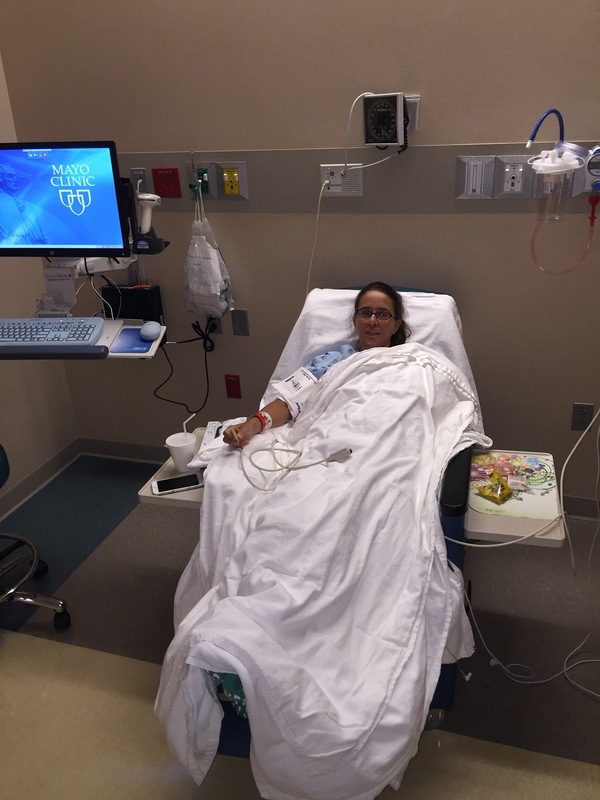 On Tuesday, September 13th, Andrea had her oophorectomy surgery at Mayo Clinic. We got up early at 5:00 and Andrea had to wash herself with her anti-microbial soap. We drove to the hospital and checked in and she went back pretty early to get prepped and ready for surgery. Her surgery started around 7:45 and I waited in the waiting room until around 10:00 when the doctor came to tell me everything had gone well. From his visual inspection, the ovaries had looked normal, although we wouldn't know for sure until a couple days later when pathology told us that they were fine. I was able to go back and see Andrea around 11:30 and I sat with her for a little while until she had enough fluids and was awake enough to go potty. After that, we listened to the discharge instructions, the doctor came in to check on her, and then we were discharged. I drove Andrea the short ride home and she was ready to start her process of recovery. So far, she's been healing pretty well and has been in pretty good spirits. She's been able to eat mostly what she wants, although she is struggling a bit with constipation. Andrea has three small holes, and is a little concerned with the laparoscopic hole that's higher up on her stomach. Immediately after surgery it seemed like a bit of an indention and in the days following surgery, it's got a harder feel to it and seems to be protruding slightly. We're a little worried it's a hernia, but we also remember that after her last surgery that same spot seemed hard and odd too, so hopefully it's nothing. Either way, she's going to call the hospital on Monday to check and see what they think. Hopefully things continue to heal well and Andrea will be back to her regular activities as normal. This kind of things definitely does make you appreciate the times you're healthy and able to do regular activities, much less fun stuff like tennis.